Calling All Heroes - "The Boys and Girls of Misery"
"The Boys and Girls Misery", sets the tempo for the debut EP, 'Origins', which as a record, takes inspiration from the bands favourite genres and merges them together, creating a huge diversity and depth that has a broad appeal. Driving choruses, melodic leads and subtle nuances contracts against a dark aggressive backdrop. Each song has it's own atmosphere and meaning that can be understood individually but truly synergies when listened to in context of the whole record. The record exemplifies the heart, drive and determination behind, Calling All Heroes, telling a story of rise and struggle; mirrored in the music. 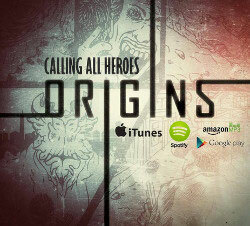 Origins, is released on Monday 10th November.